Over the years, I’ve taken quite a few writing courses and classes, both online and in person. They’ve ranged from afternoon workshops to a two year part-time Masters degree. On the whole, the courses I’ve taken have been very helpful. But I know just how easy it can be to think that another course (or class, or conference) might be The Answer. If you want to make money writing – which many people do! – then it may seem perfectly sensible to take a course, particularly one that suggests it’ll lead to financial reward. To be clear, I’m not suggesting in any way that Writers Bureau’s courses aren’t worth the money, or that their testimonials aren’t accurate! But it can be dangerous as a new (or established!) writer to take a course because you’re convinced it will result in more income for you. While courses can certainly be helpful, they can also be expensive. And this can be a real problem … because a lot of starting-out writers do not have much money to spend on a course. Never spend money you can’t afford, just to take a writing (or business) course. It’s much better to take advantage of free / cheap sources of advice – blogs and books are ideal – and earn a bit of money first, then think about whether you need to take a course or not. Yes, ideally, taking a course might lead to you making enough money to more than pay for it – but what if you get ill or busy, and have to drop out? 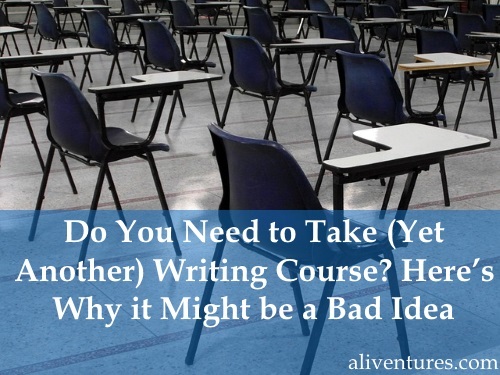 Or what if, part way into the course, you decide that type of writing isn’t really for you after all? You need to be able to write off the money spent, if needed – as if you’d spent it on going out for an expensive meal, or going on a weekend away: you won’t necessarily be able to recoup it through writing earnings. I understand how much of an issue self-confidence can be for many writers. It can be tempting to take course after course in the hope you’ll finally feel “ready” to actually write for pay. Or, if you’re a fiction writer, you may feel like you need to learn about dialogue, narrative, characterisation, plotting, and a whole bunch of other things before you begin. This can be a subtle form of procrastination – where you constantly put off actually doing the writing you want to do in order to keep reading or learning about writing. If you do feel that you need to improve your skills in a particular area, do this alongside writing. Pick a course that involves frequent assignments – or simply get a good book on that aspect of writing and try to stop after every chapter to try out what you’ve just learnt. If you’re anything like me, you probably have a shelf-full of books about writing … not to mention a hard drive clogged with free ebooks or videos, plus e-courses you’ve forgotten you ever bought! Before you buy anything new, take an inventory of what you already have. You may find that you’ve already got a book that would help you with that particular area of writing/business. Commit to working through the materials you’ve already purchased. They may not have quite been The Answer you were looking for (hint: the new course probably isn’t either) … but you can still get a lot of value from them, if you work through them, take notes, and put what you learn into practice. Next time you’re tempted to take a course, stop. Don’t feel rushed into making a decision. Online courses will inevitably reopen a few months later, and popular local writing courses will re-run at some point. Wait till the course comes round again, put aside some money for it if necessary, and in the meantime, do everything you can to use the materials you already have. Are you finding the right balance between learning about writing and actually writing? Share your thoughts, or your suggestions for other writers, in the comments. Great piece of encouragement. I’ve always felt I need to acquire more knowledge and mastery of my topic before I start writing. I guess what I need right now is to jump into it and start writing. I’ve been using the writing along side method. So far it hasn’t been a hinderance, but what was a distraction, was that I joined a few writing groups and they proved to be a distraction. Some required Writing Prompts that had nothing to do with what I am writing. They took energy and time away from my real writing goals. Now, I pick and choose which meetings to attend. I’m more in control of my valuable writing time and I’m forging ahead with completing my first manuscript and Novella this fall. I’m looking forward to the editing process to begin then. I’ve leaned it’s amazing what you can write when you stay focused and away from distractions. Your blog has been loaded with helpful information for me. Thank you for being here. It’s a great piece of advice. I agree with you that one must look at the available resources first before rushing to the paid courses. I have been learning the art of blogging for years, and every single day, I learn something new. My number one source of learning has been online blogs. In fact, YouTube videos did play a role in that. Books, however, helped me improve not just my writing but also my perspective on things. It always feels good to read your blog. Aw, thanks Hassaan! I’ve been reading blogs for years and have learnt so much from lots of generous and smart bloggers — Joanna Penn and K.M. Weiland in the writing world, in particular, and Darren Rowse and Daniel Scocco in the blogging world.